Drivers including Sebastien Buemi and Sam Bird have criticised a “dangerous” false chicane placed on the pit straight at Circuit Ricardo Tormo to replicate street racing conditions. The false chicane, made of tyre barriers, comes at the end of a long, kerb-less straight and is taken at high speed. Extremely tight, it forces drivers to steer hard to avoid heading onto a small grass verge and has started claiming cars in this afternoon’s testing session. 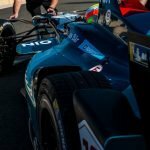 The feature has been clipped by Sebastien Buemi and Nico Prost and caused significant damage to Sam Bird’s car, distorting the right rear and damaging the complex back suspension, which on Formula E cars is directly linked to the powertrain and regeneration functions. After the session was red-flagged following Bird’s incident, Buemi went on track to inspect the damage to the barriers, which had to be repaired before the session could continue. Visibly agitated, Buemi photographed the barrier and immediately phoned race control. He went on to discuss the barrier with Daniel Abt, in the garage next door to Buemi’s, both agreeing that the barrier was too dangerous and needed to be changed, Buemi saying they needed Berlin-style kerbs. 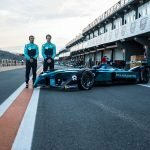 Meanwhile Sam Bird described the barrier as ‘clumsy’ saying that going from a high-speed straight into a chicane was non-representative of the street circuits Formula E normally race on and that he would not have chosen this circuit for a test. Testing was moved from previous series-home circuit Donington, in the UK, in order to better replicate the conditions of a Formula E race. 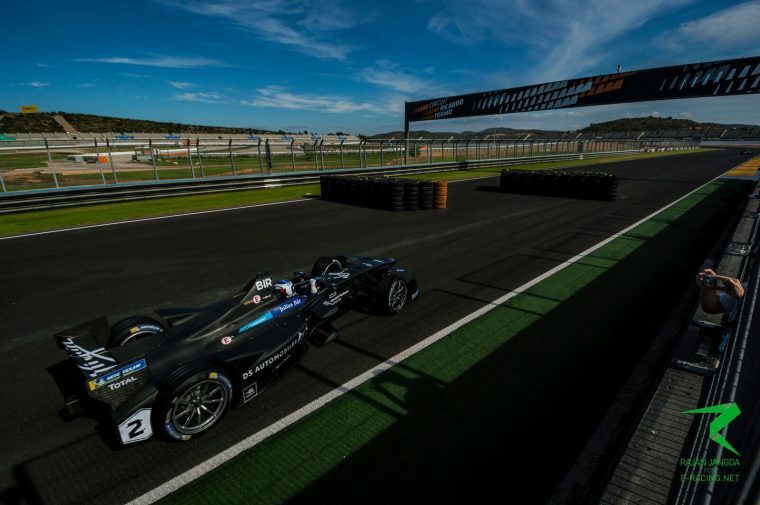 While one of the criteria has been met – which was that testing needed to be at over 25C as Formula E does not race in winter conditions and battery temperature control is an an essential part of testing – the attempt to adjust the circuit seems to have failed. With drivers so critical of the lack of kerb around the chicane, it seems likely the feature will be removed before tomorrow’s sessions as to add kerbing would require special permission from the circuit, which was not apparently sought previous to the testing sessions. Images courtesy of Rajan Jangda.